Millie Jenkins poses with her gold medal after winning the 13- 14-year-old girls' high jump. 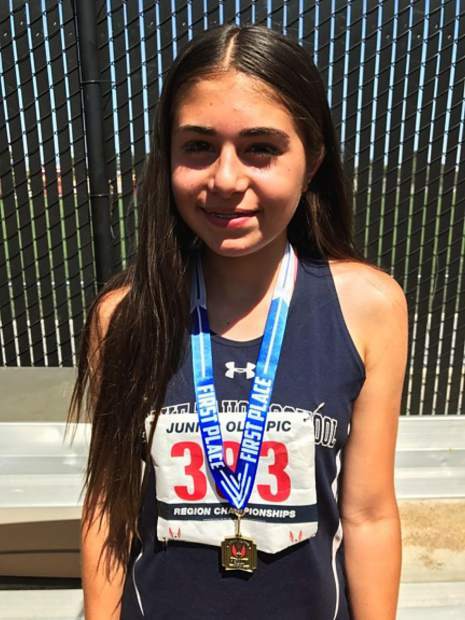 A small, yet mighty team of Incline High School and Lake Tahoe Middle School students have spent the summer break training for the opportunity to qualify for the 51st USA Track & Field (USATF) Hershey National Junior Olympic Track & Field Championships. “These young men and women enjoyed successful middle school and high school seasons representing their respective schools in the spring, but now they have come together as a team and have worked tirelessly to represent our small town on a regional and national level,” said Coach Kris Nugent, who works locally as Lake Tahoe School’s Assistant Head of School. Over the past few weeks, the team has traveled to Sacramento, Modesto, San Francisco, and Cupertino in an attempt to qualify for the National Junior Olympics, which will take place July 24-30, in Lawrence, Kan. The final two qualifying meets were elimination style, with the first taking place July 1-2; where the team competed in the Pacific qualifier, with the top eight athletes in each event moving on to the next stage. The Lake Tahoe School Bobcats had five athletes progress from this meet: Dylan Cleary in the 100 meters and 400 meters; Millie Jenkins in the high jump, 100-meter hurdles, and long jump; Brayden Snearly in high jump; Brenda Martinez-Ruiz in the 200-meter hurdles; and Riley Rau in discus. A few members of the team narrowly missed qualifying with Nicholas Patrick finishing in 11th place in the 3,000 meters, Lukas Burton setting a personal best in the 400 meters for a 15th-place finish, and Trey Casini finishing 28th against a large field of competitors in the 800 meters. The five qualified athletes then represented the team at De Anza College in the final qualifier for Region 14 on the weekend of July 8-9. Against great competition and in stifling heat, the local athletes competed fiercely. Jenkins qualified for the National Junior Olympics in two of her three events, winning the 13- and 14-year-old girls’ high jump with a clearance of 1.60 meters. She then made it through to the finals of the 100-meter hurdles, and finished 4th with a time of 15.86 seconds. Cleary qualified for the National Junior Olympics in both the 100 meters and 400 meters. Cleary set new personal bests in both events, with the 100 meters in 12.28, and the 400 meters in 57.20. Snearly collected a bronze medal with his third place finish in the 15- and 16-year-old boys’ high jump at 1.70 meters. Rau finished one spot outside of qualifying in the 13- and 14-year-old boys’ discus by finishing in 6th place, and Martinez-Ruiz narrowly missed qualifying by finishing in 10th place in the 200-meter hurdles for the 13- and 14-year old girls. Jenkins, Cleary and Snearly will now represent Lake Tahoe in Kansas during National Junior Olympics from July 24-30. “They will compete against the best in the country and I’m positive they will give it everything they have,” Nugent said.